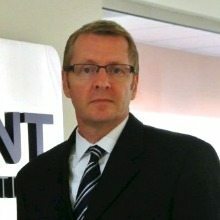 Martin Gillespie is the Director of Mobility Center of Excellence at Salient Federal Solutions. In his current role, Gillespie leads the center in implementing mobility solutions across Salient’s expanding customer base. In addition to his work with the Mobility Center of Excellence, Gillespie is also engaged in the business development efforts across the Salient customer base. Gillespie is a thought leader in the mobile community and has been building federal, state and local mobile application software since 1990. Prior to Salient, Gillespie was the Vice President at ATS Corporation where he performed business development for defense, intelligence and national security. He came to Salient through the acquisition of ATS Corporation in 2012. WashingtonExec recently spoke with Martin Gillespie about the current works of Salient’s Mobility Center of Excellence, the future of mobility, and his 2014 market outlook. WashingtonExec: Could you tell us about the Mobility Center of Excellence and what you’ve been up to since its announcement in June 2013? Martin Gillespie: The Mobility Center of Excellence is designed to bring together thought leaders, experts and additional resources to create a combination of mobile-centric solutions that we can then disseminate out to our community – that could be internally or externally to vet ideas, to offer strategic and tactical thought leadership, and to build proof-of-concept software prototypes. We also work with each of the organizations’ business units to help them with the development of opportunities that are mobile-centric. Our Mobility Center of Excellence shares mobility capabilities across government markets with next generation secure mobile solutions. Our solutions are already in the hands of thousands of mobile users, putting Salient in the forefront of BYOD initiatives. We use our own tools to rapidly create mobile applications to solve specific mission needs. WashingtonExec: What do you see as a top priority for mobile solutions providers in 2014? Martin Gillespie: The need for top-notch security is not going to change; whether it be security associated with a device, accessing the network, or securing the data that moves between the device and the network. I think that security is going to remain the top priority for the time being. WashingtonExec: What is your vision for the future of mobility applications and what would you like to see? Martin Gillespie: Speaking specifically for the government consumer I would really like to see agencies allow their systems to be used in mobile environments much more like commercial entities are doing today. Many agencies missions have the need to remotely access data and I strongly believe that opening them up for mobility would allow them to improve efficiencies and lower their IT budgets. WashingtonExec: How disruptive do you predict mobile devices will be regarding the efficiency and advancement of the federal workforce? Martin Gillespie: Advances in the government’s digital strategy and the ongoing enablement of government data releases will continue to transform how citizens do business with the government and also how citizens live their daily lives. Continuing to make this information available to their fingertips across the Internet will encourage new innovation and will reshape existing innovations. WashingtonExec: Do you think mobile devices help or hurt productivity? Martin Gillespie: In my opinion, they absolutely help with productivity. They significantly extend a user’s ability to get the job done anywhere, anyplace, and at any time. Security is always going to be a concern but mobile is really no different than other connected devices aside from the fact that there are many more of them. I believe that we are actually looking at “Bring Your Own Device” (BYOD) wrong. Neutering devices and restricting their functionality is effectively removing the mobile aspect. Having to deal with issues like what to do when an agency erases the only copy of someone’s wedding pictures is not the best use of tax payer’s dollars. Instead, mobile apps should be developed to access information across the Internet securely but without exposing the network or those databases to the outside world. Data should never be stored on the devices and should only be present for the short time it is actually being viewed. WashingtonExec: Could you talk a little about IPV6 and how it affects Internet users? What are the benefits of IPV6, for people who are unfamiliar, and why is it necessary? Martin Gillespie: Mobility is one of the reasons why IPv6 is needed. The IPv4 protocol, or standard, is out of physical addresses and every mobile device needs one. With IPv6 every mobile device will actually be able to have its own unique IP address and it will no longer be reliant on network address translation. IPv6 was built from the ground up with security in mind and it encrypts the traffic and checks packet integrity while actively providing a VPN-like protection in standard Internet traffic. This is very different from the not-so-secure internet we use today. The downside here is that this new protocol needs to be monitored during the long transition period between IPv4 and IPv6. The makers of new IPv6 compliant devices are not providing the transition-type of coverage, resulting in the introduction of exploitable vulnerabilities during this transition period. WashingtonExec: How are you all approaching the new LPTA environment in the market place? What is your market outlook for 2014? Martin Gillespie: I do not think LPTA is a major issue when it comes to mobility as mobility is broken down into multiple parts. A lot of organizations today will call mobility “the purchasing of a smart phone and its associated voice and data services.” What we are really looking at, from a mobility play, is app development. Our knowledge and expertise is developing solutions, whether they are for a citizen or for the agencies mission, to make the processes more efficient for those users of the mobile apps. In that case mobility is going to be no different than any other opportunity that the government is exposing to competition. It will certainly come into play; whether it is low price or set aside for small businesses. LPTA is one of the factors that we have to consider as a large business trying to secure mobile opportunities. WashingtonExec: Have you seen a change or improvement in acquisition life cycle process? Martin Gillespie: I have not seen a shift. I think it always takes longer than anyone expects. It depends on what acquisition vehicle the buying agency is using and the timelines associated with moving things through the specific set of processes. It depends on budgets and other factors that are sometimes politically controlled- such as shutdowns and things like that. I think that the answer is – no, I have not seen any big movement to make it better or to make it worse, it is pretty much business as usual.